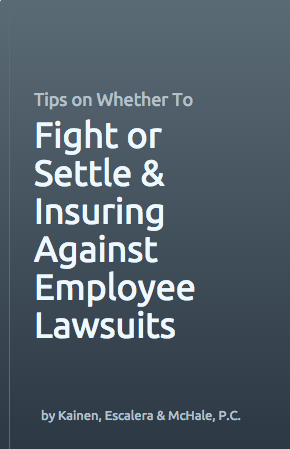 Should You Fight Or Settle An Employee Lawsuit Against Your Business? We often say that few things are as challenging as managing a workforce – or owning a business. And one of the most difficult challenges for employers involves lawsuits filed by unhappy employees. Learn as much as you can about the case as quickly as you can. Safeguard all documents pertaining to the employee and their complaint. Know who your witnesses are and explain to them what they can expect and what they may be asked to do by either side. Develop a plan for defense of your business. And insist that your legal counsel think strategically. If you think you may want to settle – make that decision early in the process to save yourself time and money. If you are an employer and find yourself faced with an employee lawsuit, call a well trained Connecticut employment and labor law attorney. Each of the attorneys at Kainen, Escalera & McHale have over twenty years of experience with these matters. And we are Connecticut’s leading employer defense law firm. Contact us if we can help you.